The man who knifed head teacher Philip Lawrence to death has been allowed to stay in the UK after winning an appeal against deportation. 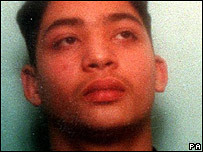 Learco Chindamo, 26, is serving a life sentence for killing Mr Lawrence outside his London school in 1995. The Home Office confirmed it would be appealing against the ruling made by the Asylum and Immigration Tribunal. A spokeswoman said: "We are disappointed with this decision and are making an application for the determination to be reconsidered". Mr Lawrence's widow said she was "unutterably depressed" by the ruling and Alan Gordon, vice-chairman of the Police Federation of England and Wales (PFEW), said it was a "ludicrous decision" to allow Chindamo to stay. Chindamo, who was jailed for life in 1996 with a minimum 12-year term, could be released early next year if the Parole Board decides it is safe to do so. Chindamo was told the news at the weekend and was said to be "pleased" because his "family and life were in the UK". In a statement he said he hoped the decision would not "cause grief" to Philip Lawrence's widow Frances or to the rest of his family and went on to express his deepest sympathy. 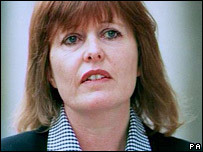 But Frances Lawrence has said she was "devastated " and "demoralised" by the ruling. Chindamo came to the UK when he was six. His father is Italian, his mother is from the Philippines and he has an Italian passport. He was 15 years old when he stabbed Mr Lawrence as the teacher defended a pupil outside St George's Roman Catholic comprehensive school. Chindamo's lawyers said the Home Office wanted him returned to Italy when he was freed from prison. But they successfully argued the move would have been illegal as Chindamo was from a European Union country and had already lived in the UK for 10 years by 1995. Chindamo's lawyer Nigel Leskin said his client was now a reformed character who was unlikely to offend again. "He was involved in a gang when he was young. He was a kid trying to act up big. He was out of control and he thought he knew everything. He now realises how wrong he was." Mr Leskin added: "He strikes me as a very reformed, very nice, very thoughtful person." A spokeswoman for the Home Office said: "We believe that foreign prisoners who have committed serious crimes should face automatic deportation from the UK at the end of their sentence." It was the second time the government had tried to remove Chindamo - an attempt in 2001 was blocked because it began too soon after he had been sentenced. 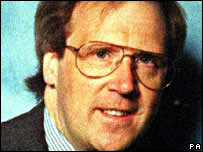 Mr Gordon of the PFEW said: "The fact that he may be paroled and back on our the streets as early as next year is in itself disgusting. Life should mean life. "What about the human rights of Philip Lawrence, robbed of his life by a thoughtless knife attack or the human rights of Mr Lawrence's wife and children, deprived of a loving husband and father." Mrs Lawrence said: "I am unutterably depressed that the Human Rights Act has failed to encompass the rights of my family." A year after her husband's death Mrs Lawrence set up the Philip Lawrence Awards to honour young people's efforts in tackling social issues. She added: "I am deeply concerned for everything I have worked for, including the setting up of the Philip Lawrence Awards. "I feel as if I can't fight any more - I feel I can't survive this." Shadow immigration minister, Damian Green, told News 24 that there was something wrong with human rights legislation if a convicted murderer could not be deported to a friendly democratic fellow EU state. "The notion of human rights fall into disrepute if it's seen that the rights of a convicted murderer somehow are put above the rights of a grieving family whose father has been murdered."